A biennial to a perennial monocarpic plant. The rhizome similar to radish, with whitish milk juice. Stem 50 - 300 cm high, fine striated, mostly violet-colored. Leaves triple feather-like chopped, external shares ovoid or oval lance, unevenly unevenly jagged, on the top with an small awn, triple top; vaginas strongly bulging. The complex sunshade is spherical, without a shell. Sun shades with linear awl similar bracts; leaflets of the calyx scaly, triangular; petals 1,0 – 1,5 mm long, 0,8 – 1,0 mm wide, greenish, broadly elliptical, curved inward, with a short claw. Fruit elliptical, heavily flattened, naked; Mericaps 5 - 10 mm long, 3,5 – 5,0 mm wide with several filament ribs on the outside, lateral ribs cork-thickened; Several channels; The stylopodium flat. 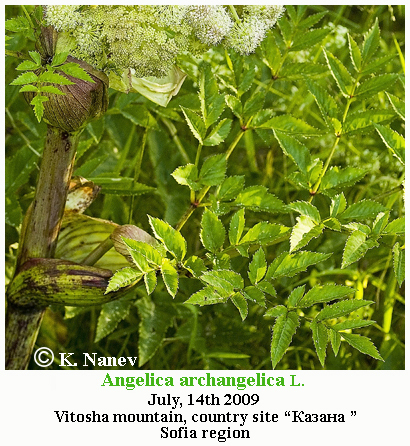 Angelica archangelica, commonly known as garden angelica, wild celery, and Norwegian angelica, is a biennial plant from the Apiaceae family, a subspecies of which is cultivated for its sweetly scented edible stems and roots. 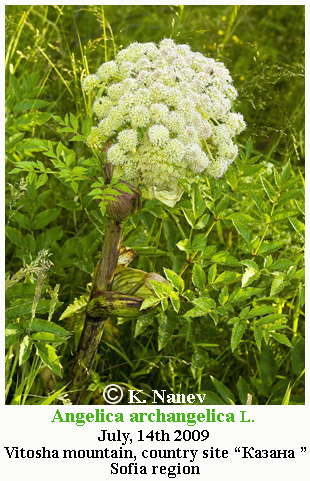 Like several other species in Apiaceae, its appearance is similar to several poisonous species (Conium, Heracleum, and others), and should not be consumed unless it has been identified with absolute certainty. Synonyms include Archangelica officinalis Hoffm., and Archangelica officinalis var. himalaica C.B.Clarke. During its first year it grows only leaves, but, during its second year, its fluted stem can reach a height of 2.5 meters (just over 8 feet), from that stem the root is known as ginger. Its leaves comprise numerous small leaflets divided into three principal groups, each of which is again subdivided into three lesser groups. The edges of the leaflets are finely toothed or serrated. The flowers, which blossom in July, are small and numerous, yellowish or greenish, are grouped into large, globular umbels which bear pale yellow, oblong fruits. 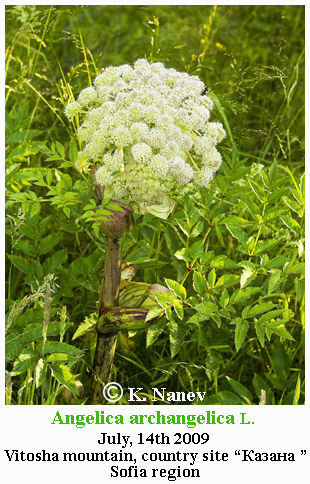 Angelica grows only in damp soil, preferably near rivers or deposits of water. 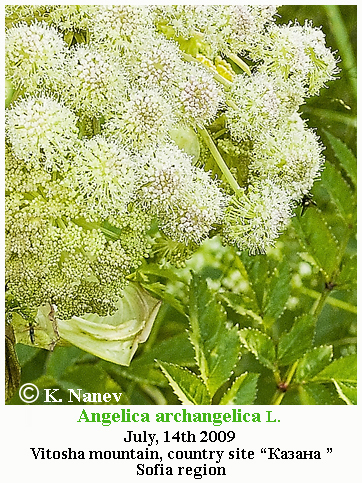 Angelica archangelica grows wild in Russia, Finland, Sweden, Norway, Denmark, Greenland, the Faroe Islands, and Iceland, mostly in the northern parts of the countries. It is cultivated in France, mainly in the Marais Poitevin, a marsh region close to Niort in the department Deux-Sèvres. It also grows in certain regions in Germany like the Harz mountains, in certain regions of Romania, like the Rodna Mountains, in hilly and coastal regions of Poland and some South East Asian countries like Thailand. Flowering Time: Bloomes: VI - VII, fruitfull: VII - VIII. Distribution in Bulgaria: It is mentioned for Northeastern Bulgaria (near Targovishte) (D. Jordan, 1921), the Black Sea Coast (around Gebece) (D. Jordan, 1928), Middle and Eastern Stara Planina (Ribaritsa) (Urum., 1898) The upper reaches of the river Beli Osam) (St. Baev, 1947) (around Omurtag) (D. Jordan., 1924), Vitosha region (Vladaya) (Panč., 1883), Western Rhodopes (Peshtera and Batak) (St. Georg, 1898). (Conspectus of the Bulgarian Vascular Flora) = conspectus&gs_l= Zlc. Distribution: Northern and Central Europe and Siberia.